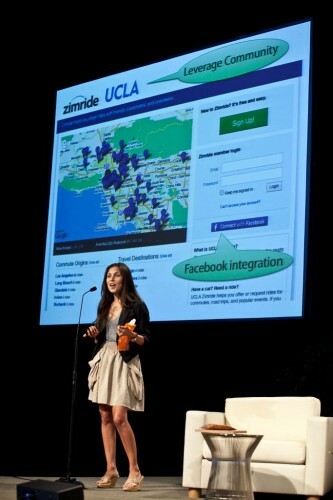 Zimride is a success at Opportunity Green Conference! No, that’s not how our acceptance speech started off, but in all seriousness, we were honored to receive the 2010 Opportunity Green Innovative Green Startup Award! There were 25 finalists, and all were very cool, sustainable and interesting companies. Saying that they were all tough competition would be an understatement. Our very own Lisa Galindo, Account Executive, represented Zimride at the conference and gave a one-minute pitch about the company. I spoke with her when she returned to the office, and she said that an amazing number of people approached her after the award ceremony, and that the support was electrifying. If you want to check out what everyone is finding so interesting and innovative about Zimride, and maybe getting it for your organization, please contact us at community@zimride.com.